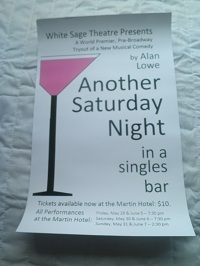 Congratulations to Alan Lowe whose work Another Saturday Night was performed at the Martin Hotel in Winnemucca, Nevada by the White Sage Theatre. It was the World Premiere with a view to it going "Off Broadway" and then possibly to Broadway itself. It was produced by Mr John Matlock. Another Saturday Night ((Play, Musical - 97 pages, doc format) by Alan Lowe - A Musical set in a Singles Bar involving three four women and four men. Congrats mate... this is something I've been toying with doing for a while now. You may just have inspired me to go ahead with it. Congrats, fingers crossed for an extended run! To anyone wishing to use my scripts. You have my full permission to use them. If they contain musical numbers you must contact PRS to pay them, I think it works out at about 2% of the take. If you are an amateur group there is no charge from me but I would appreciate being informed that you are doing one. Sorry for the delay, only just got back to the site as I have been working on a couple of books.